The divorce complaint was filed Sept. 12 in Ocean County Superior Court, citing irreconcilable differences between JWoww, whose real name is Jenni Farley, and Roger Mathews. 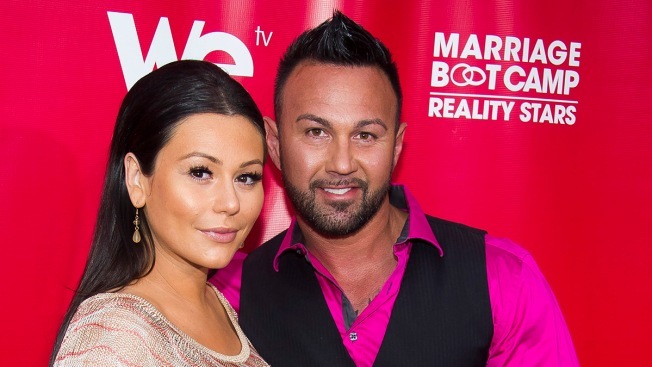 In this May 29, 2014 file photo, Jenni "JWoww" Farley and Roger Mathews attend WE tv's "Marriage Boot Camp: Reality Stars" party in New York. Farley of the hit reality television show “Jersey Shore” has filed for divorce from her husband of less than three years. The 43-year-old Mathews is a truck driver who has made appearances on the series. The reality show "Jersey Shore" ran on MTV from 2009 to 2012 and followed the antics of hard-partying people in their 20s living on the New Jersey coast and other locations. The current series reunited the cast members after marriages and parenthood and is in its second season.